Cité de l’espace offers you the chance to explore the moon, re-live past exploits and understand the current challenges of returning to our natural satellite. 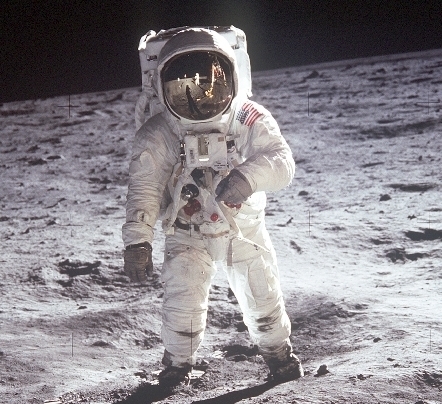 In 2019, Cité de l’espace celebrates the 50th anniversary of Man first setting foot on the Moon and will be organising a broad programme of events around the lunar theme, both at Cité de l’espace and elsewhere in partnership with many cultural and scientific stakeholders in Toulouse. 50 years after we first set foot on the moon, on 21 July 1969 (UTC+1), projects for Man to return to the famous celestial body are becoming clearer. Cité de l’espace invites you with its new exhibition “MOON: EPISODE II” to prepare yourself for these new challenges. Get on board for a lunar voyage “made in” Cité de l’espace. How? First of all by re-living the Apollo 11 exploits, with Neil ARMSTRONG’s and Buzz ALDRIN’s first steps on the moon, thanks to a retrospective full of emotions and memories. A unique way to explore the “dark side” of this event of global importance and the incredible challenges NASA’s teams had to solve 50 years ago. The core of the exhibition will raise public awareness of the lunar environment, this celestial body which is so beautiful and at the same time so hostile, and the current challenges to be met to allow a sustainable human presence. Sensory experiences and surprising challenges are on the programme! From July 21st until the end of the MOON EPISODE II exhibition, Cité de l’espace will have a full-size LM (Lunar Module), the module which landed men on the Moon on July 21, 1969! This film brings a new look on the famous Apollo 11 Mission thanks to unseen images and archives, to be discovered on a giant screen. Director Todd MILLER brings to the public this incredible scientific and human epic, delivering the atmosphere of the last preparations for takeoff, the first steps of man on the Moon and the return of this famous mission. This immersive experience offers a new look at one of humanity’s greatest achievements: Man on the Moon. Produced by Statement Pictures and CNN Films and distributed by MacGillivray Freeman Films. At the Cité de l’espace, from June 2019. Throughout the year, Cité de l’espace offers an eclectic and original programme allowing everyone to explore the Moon in a new light. Conference with Bernard FOING, ESA ESTEC astrophysicist, International Lunar Exploration Working Group (ILEWG) executive director, IAA member, professor at VU Amsterdam, ISU, ISAE. Conference organized with the Academy of Air and Space at the José Cabanis Médiathèque in Toulouse. Lecture with Laurent THIERRY, Doctor in History, Historian at La Coupole and a space historian. Exhibition “Diving in the hell of Dora, 9000 unique destinies” proposed at the Cité de l’espace from 5:30 pm on May 15th and until May 31st. Screening of the ARTE documentary film “Children of Buschdorf”. An event organized by the Friends of the Foundation for the Memory of the Deportation (Delegation 31) in partnership with ONAC, La Coupole, Friends of the Cité de l’espace and 3A CNES. For the Children Scientific Congress 10th edition, within the school and high school link framework, 500 pupils have for mission to imagine their “high school on the Moon”. After discovering our satellite’s constraints, they will have to find together innovative solutions to their new student life… on the Moon! Conducted in collaboration with the Academy of Toulouse Education Board and the Federal University, this project aims to generate interest in science and trust students by giving them the floor. Just like genuine congress researchers, they will share the results of their scientific work on June 7, 2019 at Cité de l’espace. This year the congress will also be organized in the region of Apulia in Italy, with local classes both on the same theme and same day. It will be coordinated by Cité de l’espace. Meeting around Jules MASSENET’s masterpiece, Werther (1893), presented at 8pm: Jean Jacques GROLEAU, playwright at the Capitole National Theater, and Serge GRACIEUX, Heritage Manager and Space expert at Cité de l’espace, will converse about Massenet’s Clair de Lune and the passionate relations between Man and our nearest star, the Moon. As part of the 50 years anniversary of the first step of Man on the Moon. From June 20th to July 2nd – Reservations: www.theatreducapitole.fr – 05 61 63 13 13. Cité de l’Espace is open continuously from 10am to 11pm with special events such as telescope sky observations, garden lighting and mapping. From the stone to the star! An evening under the stars – organized in partnership with the French Association of Astronomy, Planète Sciences Occitanie and many regional actors of Astronomy, to discover the sky in another way. Wednesday, October 2 at 6.30pm – Conference: Space: L’Europe peut-elle décrocher la Lune? (Can Europe “reach for the stars”? ), organized by the Cité de l’espace Friends and CNES 3A. Meeting around Norma by Vincenzo BELLINI (performance at 20h): Jean Jacques GROLEAU, playwright at the Capitole National Theater and Serge GRACIEUX, Head of Heritage and Space expert at Cité de l’espace, will converse about one of the most fairly renowned belcanto, Casta Diva – a true ode to the Moon – and the passionate relations between Man and our nearest star. As part of the 50th anniversary of Man’s first step on the Moon. Norma: Reservations from June 5th on www.theatreducapitole.fr. Aeronautical sciences & dynamic propulsion. An event sponsored by Sylvestre MAURICE, Astrophysicist and Planetologist at IRAP. Besides the propulsion question, Manon LANJOUERE will explore the question of the human body in space along with the themes of dream and the astronauts’ flight imagination, as part of the 50th anniversary of the Man on the moon. With Jean-Pierre Luminet: astrophysicist, writer and poet who will give a lecture on Edgar Poe’s amazing scientific intuitions. An occasion to rediscover great texts of the literature focusing on the Moon, while observing our natural satellite in the Cité de l’espace…along with many other surprises. Round table organized at Cité de l’espace in partnership with Les Amis de la Cité de l’espace and CNES. Stimulating curiosity, the desire to learn more, creating scientific vocations, making space, astronomy and scientific culture accessible to all, these are the aims which underpin the Cité de l’espace’s activities with the support of its partners, especially Toulouse Métropole. Cité de l’espace is the leading European site for the distribution of space and astronomy news to the general public. Cité de l’espace is a Toulouse Métropole facility, opened in 1997 on the initiative of Toulouse City Hall, with the support of the Occitanie Region, its co-founders CNES, Airbus, Météo-France, the Ministry of National Education, and the participation of its associate partners, Thales Alenia Space, Caisse des Dépôts et Consignations, Caisse d’Epargne Midi-Pyrénées,ESA (the European Space Agency), Canopé, TOULOUSE III Paul-Sabatier University, CNRS, OMP, IRAP, Snecma, Onera.